The fight did not last long. The two veteran Witches banded together with their elder, Cassandra, and turned the tide, sending many of the various otherworldly visitors back to their homes. But it was a massive flash of solar light that sprayed out from Jemma which ended the onslaught. Overall it was a gruelling battle, and while worn, all 5 Witches huddled together in the corner of their now slimed and gross home. "Ok, so I should probably have let you all know," Jemma smirked sheepishly, "I might have kind of strayed a bit from Gaia this last year and fed from the sun a bit too much." In unison, the other Witches shouted, "Ya think!?" Over the last year one of you has used a little Black Magic. Now each night from Midnight till Dawn, your personal Demons are physically manifesting, attempting to steal your Magic and souls. Combating them helps and hurts your other Coven members due to your bond and if even one of you succumbs to their assault, the Coven is lost. 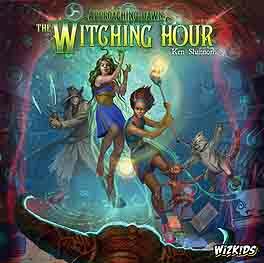 Approaching Dawn: The Witching Hour is a co-operative game for 3-6 players. You each are members of a Coven in the universe of Approaching Dawn. A world where Witches cast spells and Demons can exist in the darkness, banished by the light. The Witching Hour has a unique design where what you do imposes risk on another player. Each Witch has a deck of cards from which they form a hand. Each card in the hand can be played as White Magic able to assist your allies, or as powerful Black Magic focused on helping yourself...and hurting your friends. Simultaneous playing of each Witch's hand of cards, in response to the Demons they are facing, and the Secrets the Witches have from each other, forces each Witch to alter their game play, making each game...interesting to say the least. 5 Scenes, each of which alters the way the game plays, and its duration (from 30-90 minutes). Similar to a season of a television show, these scenes can be played in sequence, where both the story and difficulty progresses. Each Witch has different abilities to choose from and their own special deck of spells. A unique Sigil mechanic allows you to play more powerful spells with increased risk of summoning Demons...on your allies, applying the risk to an adjacent ally instead of yourself. Simultaneous play combined with group decisions creates a unique feel; more interesting to those normally averse to co-op games. Starting cards are used to power more powerful spells, thinning your deck in a natural way.